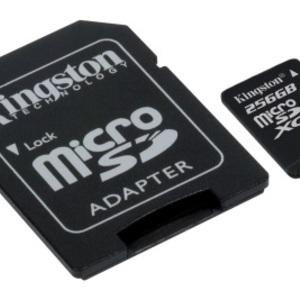 The Kingston Class 10 UHS-I microSDHC/microSDXC memory card has 256 GB capacity. Users can capture up to 64,000 12 MP images and up to 976 minutes at 1080p 30 fps HD videos. The product is suitable for cinema-quality HD 1080p video and reduces buffer time between shots when compared to Class 4 cards. The card can withstand harsh environments as it is waterproof, temperature proof, shock and vibration proof and X-ray proof. Capacities of 16 to 256 GB make it easy to find the right card for user needs. 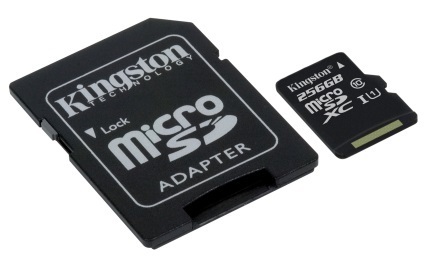 The product is available as a standalone card or with an SD card adapter in 16, 32, 64, 128 and 256 GB capacities. The product dimensions are 11 x 15 x 1 mm and the SD adapter dimensions are 24 x 32 x 2.1 mm. The operating temperature is -25 to 85°C. 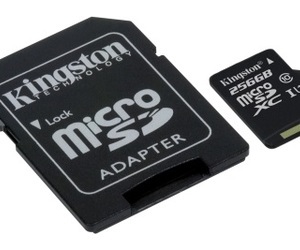 I am interested in Kingston Class 10 UHS-I microSDHC/microSDXC memory card .